Joshua and Klitschko put on what remains the clear frontrunner for Fight of the Year honors, and there’s no guarantee that any two – or four, or more – of the participants in Saturday’s “Superfly” card (HBO Boxing After Dark, 10:15 PM ET/PT) will combine to produce anything that might match or exceed that contest. But it would be a brave man indeed who bet against any of them doing so. The super-flyweight (or, if you prefer, junior bantamweight) division is stacked with talent, and the StubHub Center will be showcasing the cream of the crop on Saturday. No matter how good a boxer, he can ultimately only be judged against the quality of the foes he faces, and it is a peculiar phenomenon of boxing that, at various times, the stars align in such a way that various divisions take their turns at being the relative center of gravity. Most famously, the 1980s saw a succession of great fights between Wilfred Benitez, Sugar Ray Leonard, Thomas Hearns, Roberto Duran and Marvin Hagler; but some of that quintet squared off first at welterweight (Duran began his professional career at lightweight) and then junior middleweight before Duran, Hearns and Leonard moved up to 160 lbs., where Hagler was waiting for them. Rungvisai believes that something similar has happened – on a literally smaller scale – to create the concentration of talent at super flyweight. “The best want to fight the best, so everyone moved up from 108, 112 to 115 so they can fight the best,” he explained to HBO Boxing earlier this week. The six fighters on Saturday’s card boast a remarkable combined record of 190-9-4, and of those nine losses, three came very early in the career of Rungvisai (who started out 1-3-1 before subsequently going 42-1) and four came at the hands of each other (Rungvisai lost to Cuadras, Gonzalez to Rungvisai, Cuadras and Estrada to Gonzalez). In addition to talent, the card boasts storylines: Gonzalez, formerly considered the number one fighter in the sport, pound-for-pound, is looking to avenge a controversial March loss to Rungvisai in a brutal fight; Cuadras and Estrada – who, before Rungvisai defeated Gonzalez, were the two opponents who came closest to doing so – squaring off for the right to face the Gonzalez/Rungvisai winner; and Naoya Inoue, who has risen rapidly to prominence and become something of a darling among those who scour YouTube for fights on distant shores, making his US and HBO debut against a determined Nieves. None of the six boxers is close to being the biggest or tallest to enter the ring on HBO this year, but top to bottom the entire card is almost certainly the deepest. Gonzalez’s battles with Rungvisai, Cuadras and Estrada were all sensational brawls; it would be a shock if Saturday night doesn’t produce at least one fight that proves equally electrifying. 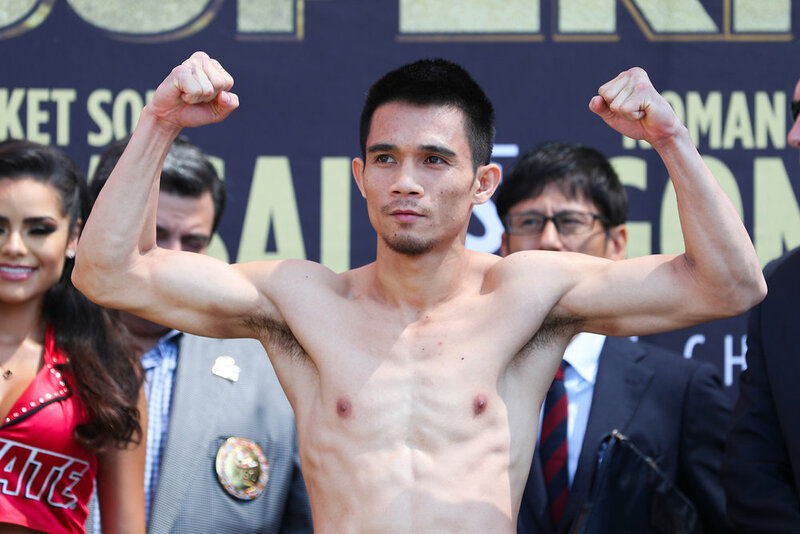 Srisaket Sor Rungvisai: 115.0 lbs. Roman “Chocolatito” Gonzalez: 114.8 lbs. Juan Francisco Estrada: 114.8 lbs.